The ever popular F80 Swedging tool now comes equipped with 3 collets including the addition of the new .106? collet for the smaller keys on the oboe and piccolo. The collets are now: .106?, .149? and .187? which is approximately 2.69mm, 3.78mm and 4.75mm. This completes our swedging collet series; with the addition of the 3 new, smaller collets to the P60 Rotary Bearing Tool that can now be used on large keys too. The .187? closes to about .150? ; the .149? closes to about .118? ; the .016? 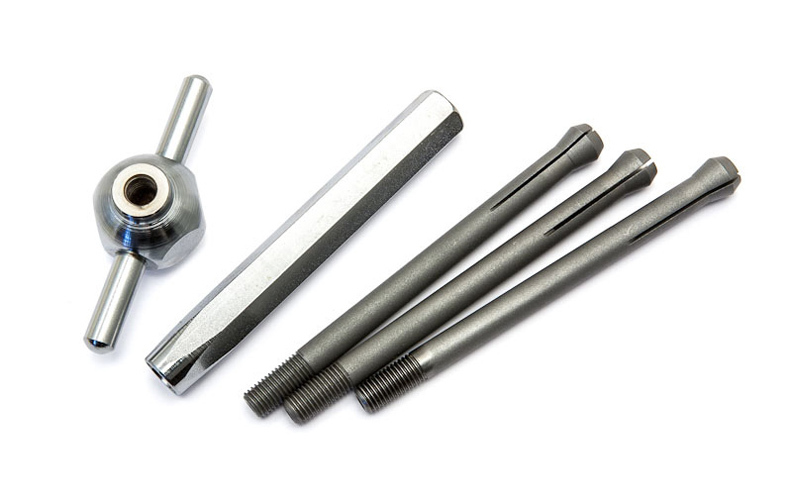 closes to about .075?.Also availableF80 Swedging Tool with 3 colletsF80B Body and Knob onlyF80C-106 Collet .106?F80C-149 Collet .149?F80C-187 Collet .187?